Solid Advice to Follow for Planning Your Next Meal! I was recently out to eat at a restaurant in downtown New York City that inspired this piece. While the name of the establishment will remain nameless, I’ve noticed this particular restaurant’s downfall becoming a trend, sweeping across both Manhattan and the nation as a whole. My friend and I showed up for dinner decked out in our finest jeans, t-shirts and sneakers. A casual spot, we were led to our table by an unkempt, disheveled looking teenager and presented menus and a wine list. For food, we had an assortment of gourmet dishes to choose from, including a “chicken cutlet sandwich” and a “cheeseburger with sweet fries”. Nope, these were not kids menus. You wouldn’t serve Beluga Caviar with Lay’s potato chips for scooping, would you? If you slow down and listen to this conversation you will hear two wine commentators share personal thoughts that will help expand both your wine journey and wine pleasure. Sauvignon Blanc by its very nature will range from intense zippy flavors to a more subtle and balanced profile. Listen to Gary and you will learn he likes knife-edge acidity and wines that lean almost to an out of balance profile. Jayson on the other hand prefers an elegant and restrained style.This can be because of the number of bottles produced, yields in the vineyard, extended lees contact, some with barrel fermentation or even blending semillon into the finished wine. Whatever the reason, this leads to the next interesting idea. Ratings reflect a moment in time and do not reflect the context or setting in which wines are enjoyed. While both Gary and Jayson liked the St Clair Sauvignon Blanc it was more suited to Jayson’s style. The critical wine reviewers will tell you they are critical wine reviewers because they are independent judges and have neutral opinions. All wines have a style or personality about them and reviewers will naturally connect more with certain styles. High scores, medals, rave reviews are only relevant if you truly know the wine preferences of the critic and how they compare to yours. Be brave make the effort to learn what you like! The only opinion that counts is yours. This phrase is repeated throughout the conversation. There is a reason for this – it is your money – your wine decision – your dinner with friends. These regions even have sub regions within the regions. This is another good reason to get to know your wine retailer or sommelier. Both Jayson and Gary know their path to success is directly tied to your wine satisfaction. I am confident both are good sources to expand your wine experiences. Enjoy this conversation between two wine people who care about you. I like this movement. It has the potential to do great things for people all around the world. Great things will happen when people slow down – I suspect research would show one of the dimensions of greatness is the ability to go slow – even when things are spinning out of control. We all need to take a moment and feel what Steve Nathan from Salavare Estate in Hawkes Bay New Zealand is suggesting. Below are his comments from his web site and Facebook pages. While he specifically, suggests slowing down and enjoying all things Hawkes Bay – which we should do – we can adjust his suggestions and go exploring the fun regions around the world that produce food, wine and travel with sense of spirit and bring that spirit to our daily routine. Being small and relatively new to the wine industry has not stopped Steve and Bev Nathan of Hawkes Bay winery Salvare Estate trying to promote an idea they think will benefit both wine lovers and smaller “boutique” wine producers in New Zealand. Since opening their tasting room at Bridge Pa twelve months ago they have been promoting a “Slow Down” theme through their Salvare label, which includes range of local Hawkes Bay wines and a number of food lines such as Olive Oils. In addition to taking things more slowly, one of the key tenants of the various “Slow” movements, including Slow Food, is that we should “buy local and eat local”. That we should know where our food comes from including, where we can, the people who grow or make it. The Nathans believe we should add “drink local” to this mantra. Over the last few years I have been showing different small production Sauvignon Blancs from New Zealand. Two wines were from different regions in Marlborough, the Golden Mile and the Awatere Valley. Another the Waipara Valley near Canterbury. All have different approaches in the vineyard and winemaking to include blending of Semillion, another high density vineyard planting and yet another the subtle use of barrel fermenting. All are produced in small quantities of less than 3,000 cases. In New Zealand, wines like this are the minority in terms of total litres produced and the majority in terms of number of producers. About 87% of all New Zealand wine producers make less than 25,000 cases per year. This means the majority of wines found outside of New Zealand are from the bigger players, this makes sense. Here is an exchange that took place in London that highlights why much of New Zealand’s wine never leaves the country. Their reply was “Please don’t apologise. It’s a well known fact back at home that the cheaper wines are produced for the masses and the locals won’t buy it – so we send it over to you!” You can read the full article here. For this reason, it was not uncommon to hear the phrase “No Cookie Cutter Wines” because most people had and still have not been exposed to this side of New Zealand wine. So I filed the comment away for future use. At the same time there were many comments about wines from many places all starting to taste the same and it made sense to use the comment for a greater purpose. 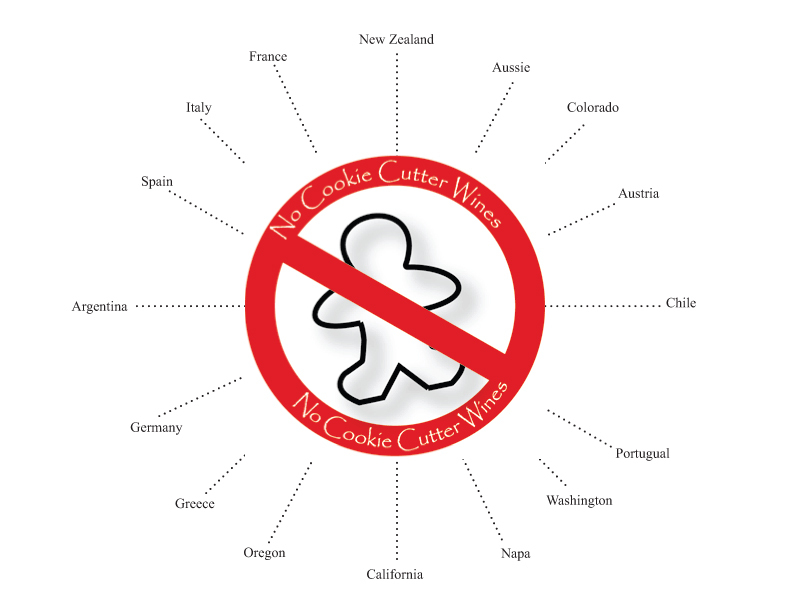 Here are few writers who have used the phrase Cookie Cutter Wines to describe this category of wine. Alice Feiring, Frank Prial, Howard Goldberg, Eric Asimov, a web search will find more. Today, we have a simple site with some guest commentary about wine. The site is open to those who have a story to share. With today’s changing flow of wine information, this is one more place to both contribute and find new and delicious wines. We will also develop the regional themes in the image below.